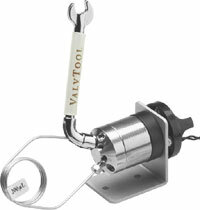 The ValvTool is a time-saving device which provides easy access to many hard-to-reach areas. The unique design with its slotted wrench allows tightening of nuts where a loop or a capillary might otherwise make it difficult. The ValvTool is ideal for Valco and Rheodyne® valves and fittings, as well as most of the HPLC and PEEK fittings on the market with 1/4" and 5/16" heads.